Please click here for an application pack. The branch committee will now arrange for the levy to be applied and will recruit a branch organiser. We asked you to agree to a slight increase in the branch levy element of our monthly subs of just £1 per month so that we can hire a worker for around three days per week to resource the branch. The increase will not be applied to those working less than 10 hours per week, or on reduced subs rates due to being on unpaid sick leave, maternity, etc. Those who experience genuine hardship in paying the increase will be able to reclaim it. 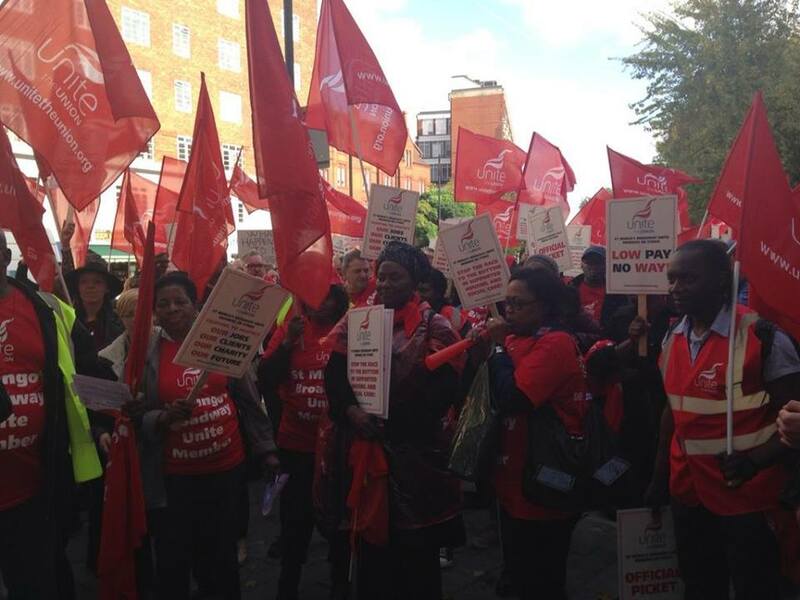 The Unite Housing Workers Branch has been highly successful in organising and mobilising resistance against cuts to members’ wages, terms and conditions. On each occasion we have won some concessions. In some campaigns, we have won every single demand that members have put forward. This is a sector that is highly interconnected. The chief executive of one organisation sits on the board of another. The senior managers network and coordinate between themselves over the employment terms of their staff. Therefore when we win one battle, we know that it deters others from attacking the employment rights of their own staff. We have won disputes at St MungosBroadway, One Housing Group, and the Homes and Communities Agency when we have taken strike action. We have won disputes without strike action at Look Ahead, Peabody and others. We have campaigned on wider housing issues, including co-organising the March for Homes highlighting the severe London housing crisis in January. We have campaigned for Sector Standards which will operate across multiple associations to equalise and embed rates of pay and other terms and conditions, taking these elements out of the commissioning process. We know that through these struggles, we have empowered lots of our members to challenge injustice. We know that because of the closeness of associations, we have improved the pay, terms and conditions of a much wider section of members than just those directly involved in each dispute. And we have done all of this with one Administrator employed for just one day per week. All members of the Branch Committee, the Assistant Branch Secretary included, and all other activists give their time freely and on a voluntary basis to keep the branch working and to maintain our striking track record of success. With repeated victories, new groups of members in previously unorganised workplaces, or members in organisations where union activity had become dormant, are having the confidence to collectively challenge their management. But we could do more, both to support these emerging campaigns and to act strategically across the sector. We are therefore aiming to employ a dedicated organiser to meet members, help them to elect representatives, and create strong workplace-based collectives in order to follow through on these early efforts with the aim of creating a series of self-sufficient but connected and mutually supportive groups. This requires an increase to the branch levy of just £1 per month for those on full rates, dis-applied for those on reduced payments. The majority of members will therefore pay an increase of just £12 per year. Please vote now and please AGREE to the raise. The vote will be decided by a simple majority of those voting. More details on the branch staffing proposals are available here.